The Friend Game Asks: How Well Do You Really Know Your Facebook Friends? Do you think I'm a bigger tipper than you are? Do you think I remember the name of my kindergarten teacher? Imagine that we're friends and that a video game is asking you these questions. Imagine that it asks you to answer questions about yourself, too. For example, if you were the first person on the moon instead of Neil Armstrong, would you have thought of something cooler to say than "One small step for man…?" These are questions in The Friend Game, a new and potentially excellent Facebook game from the same New York-based game studio that developed a cell phone obsession of mine, the puzzle game Drop 7. Answering questions like those about yourself and your friends is how you play The Friend Game. Correctly indicating how your friend would have answered the same question—about herself or about you—is how you win. The game is played on Facebook, where it is currently in closed beta (you can try to play it at this link, but the beta player count is likely to cap out soon). You have an avatar. Your friends do, too. Clicking on your avatar or theirs lets you answer questions about yourself or them. Sometimes you're answering questions your friends haven't answered yet. Sometimes they have answered and you're scored on whether your answer matches what they said (to be clear: you're not getting points if you both say you're hopeless romantics; you're getting points if you both said that you are a hopeless romantic—or if you both said you're not). Lantz wants people to think of it as a party game, a drinking game, and a "social karaoke." It's also a Zynga game, so even in its beta form, it already has a metered energy system. It's free to play, but if you want to play a lot at once—and if you stink at knowing how your friends would answer questions—you can pay more to keep plugging away. 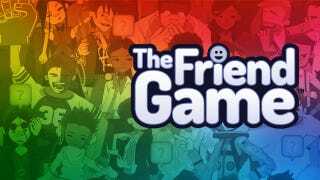 The Friend Game has been a long time coming and, full disclosure, I've been rooting for it before I even knew what it was. Lantz and I have been friendly for years. I've quoted him in articles, attended gaming events in New York City that were overseen by him in his second career as the director of the Game Studios program at New York University. And I've had drinks with him, though he's managed to keep any and all details about his game—the first official game from his studio, Area/Code-turned-Zynga New York—until we spoke yesterday. And if it helps, my kindergarten teacher's name was Mrs. Dawson. And I'd let McDonalds continue to exist. I enjoy their breakfast sandwiches too much.